HOT DEALS: Pre-Christmas offers from Amazon, Comet, Currys and Play.com | What Hi-Fi? This is the busiest online shopping week before Christmas, so we've had a dig around and picked out some bargains for you. Amazon is again running a series of 'Lightning Deals' this week, and today's offers include a Sony SMP-N100B wi-fi media media player, a Philips 52PFL8605H LCD/LED Full HD TV and a Nextbase portable in-car DVD player. You'll have to hurry as stocks are likely to be extremely limited and are only available for a short time. Also on Amazon, there's a series of '12 Days of Christmas Deals' in the electronics section. Offers include a designer Groov-e iSpeaker Dock 50 for £47.99, and a pair of Philips SHN5600 noise-cancelling headphones for £36.99. You can also get Monster's Beats by Dr Dre headphones for £177.65, saving £92.95 into the bargain. Among the TV offers are a saving of 75% on a 3D Blu-ray player and two pairs of 3D glasses with selected Panasonic models, claim up to £150 cashback on selected Sony TVs (and £50 on personal video recorders), or a free 3D Blu-ray player and 12-month LoveFilm subscription with some Toshiba TVs. Over on Play.com there are bargains to be had on TVs, headphones, iPod docks, Blu-ray discs, games and CDs in the 'Deals of the Week' section. We've spotted X-Men Quadrilogy on Blu-ray for £9.99, an Apple iPod nano for £119, a Sony CMT-BX77 DBi micro system for £119.99 and an LG D2342DP 23in LCD/LED monitor plus Assassins Creed game and two pairs of 3D glasses at £169.99. Meanwhile, over at Currys there's a Panasonic Viera TX-L32U3B 32in Freeview HD LCD TV for £299, Sony's iPad-rivalling Tablet S for £350.10 and an LG M2280D Full HD LCD/LED TV for £150. 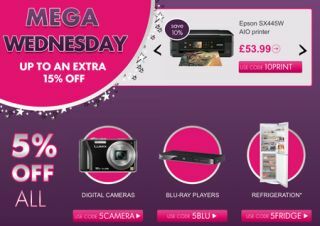 And Comet has up to 15% off in its Mega Wednesday sale. Oh, and Asda has some TV and PVR bargains, as we've previously reported. If you spot any more top bargains, let us know in the Comments box below.